The Danish rock veterans Pretty Maids are celebrating their 30th anniversary as a band with their first Live CD/DVD release ever. Their successful album from 2010 'Pandemonium' was a real new start for the band and one of the best album that year and maybe the best they ever made? With almost 2 hours of music, with a blend of great melodic rock songs from their career, there's 2 CD's full of nice entertainment for the true fans. Personally attracts the DVD me more, because that's how you will get a close and pleasant live feeling especially with a large TV monitor and big home theater system. 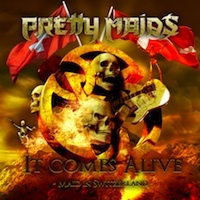 Pretty Maids gathered in Pratteln, Switzerland with an enthusiastic and highly explosive crowd of die hard fans and followers to fulfill the demand for an energetic and memorable performance which was recorded with a fully equipped mobile studio and cameras. PM deliver some solid party tracks with good production and hopefully they will release a follow up and a new studio album soon.